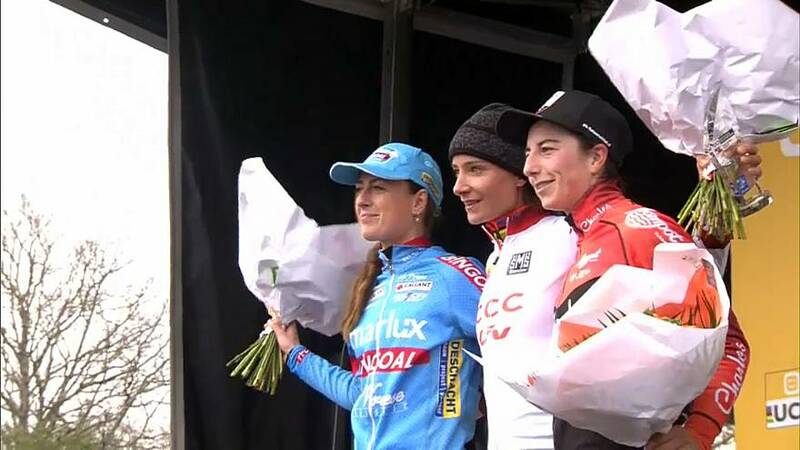 With just one race before the end, it looks almost certain Dutch cyclist Marianne Vos will claim the cyclo-cross World Cup title in Pontchâteau, France. She has an unassailable lead at the top of the standings, after winning her second race in a row on Sunday. Her total race time was 46 minutes 53seconds, a full 8 seconds ahead of another Dutch competitor Denise Betsema. Belgian World champion Sanne Cant was absent from the round. Vos and Ceylin del Carmen Alvarado were early leaders in the race. but by the fifth lap, Denise Betsema and Vos had split from the others on the 3.02 km course. The finals of the eight-round tournament will be held on 27 January in the Netherlands.